When Did The Fed Start Buying Equities? - Indicators Are When "Taper" Ended! There is a strong and not exactly unreasonable suspicion that most of the economic policies favored by the Trump administration (at least some of which will presumably be backed by the Republican-controlled legislature) are likely to push price inflation up. Higher government spending, tariff hikes, the possible deportation of cheap illegal workers, etc., are all deemed to lead to higher consumer prices. Keep in mind in this context that the inter-temporal price distortions along the production structure triggered by the Fed’s loose monetary policy in recent years are fated to eventually shift and reverse anyway. Resources have been miscalculated as too much has been invested in the higher stages of the economy’s capital structure relative to the lower stages. Eventually a bottleneck should emerge in terms of the demand for and supply of final goods, in conjunction with hitherto suppressed natural interest rates reasserting their influence on market rates. The problem is that the real savings needed to support and maintain a lengthened production structure never existed – they were an illusion created by the printing press. The same holds for the decline in consumer demand implied by an increase in savings – it simply hasn’t happened (at least not to the extent indicated by market interest rates). The real funding for long term investment projects still needs to come from somewhere though. It such investments are not supported by an increase in real savings, capital will be consumed. The falsification of economic calculation engendered by prices that have been distorted by credit expansion inter alia leads to the reporting of illusory accounting profits – later it turns out that capital maintenance has been lacking and the previously reported profits turn into very large losses (think about 2008/2009 as the most recent example of such an “unmasking”). At some point the capital consumption will be reflected by a surge in market interest rates and a shift in prices. Many of Trump’s policy proposals (if implemented) are likely to hasten this process, ceteris paribus. The following chart is from Lance Roberts which we have also taken the liberty to mark-up. here we can see the impact of the Fed ending its various programs and then being forced to start yet another program to keep the US Economic engine from stalling and plunging the US into a recession -- or worse! On the surface it would appear that after QE "TAPER" ended the Fed completely moved to the sidelines. 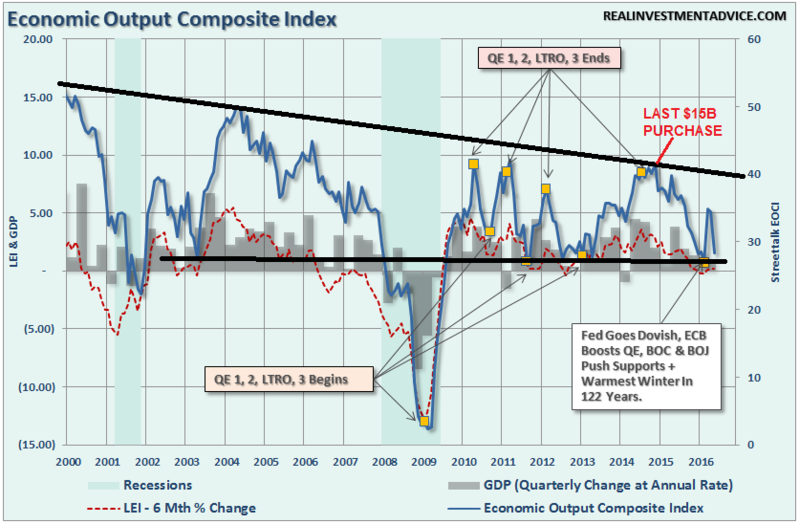 At precisely the end of the QE "TAPER" program we again witness another inflection point. This time it is the divergence of the S&P 500 from earnings as measured by the 12 month trailing EPS. Something or someone began supporting and lifting the market at the end of the Fed's QE "TAPER" program. Who would have had the motive, money and means to do this - and also chose this timing to do it??? Circumstantial evidence? I suspect the court of public opinion would return a conviction. Why would the Federal Reserve not do the same as other central banks are doing, especially since the sovereign debt market buying is already dominated by their central banks? We have been expecting this type of Fed action and suspected it was occurring since early 2015. We were especially convinced after Janet Yellen publicly suggested this as a real possibility and "benefit" in September 2016. 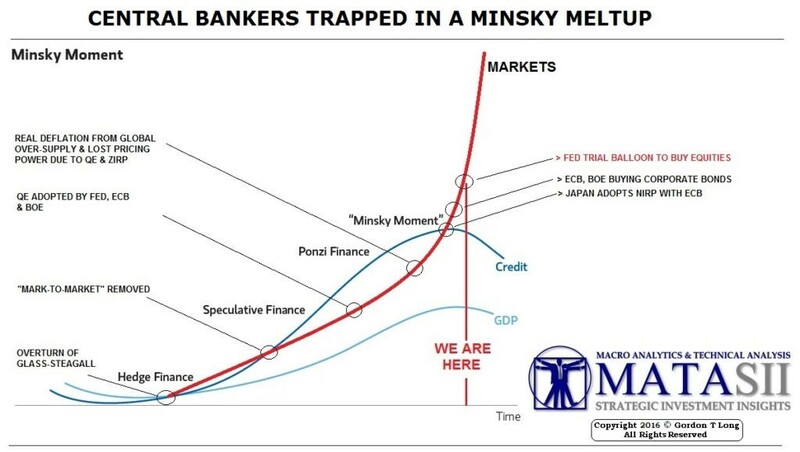 If this is in fact the case, we believe it will become even more pronounced going forward and jetison the markets potentially into "Minsky" type melt-up.